Sweet Sunny came to us a bit scared and shy, but with some top-notch fostering (thanks so much Anne), she emerged from her shell and started to shine. She learned how to get along with a rambunctious young GSP brother, she charmed some humans who insisted on visiting with her weekly, and she even finished a 5k race with a young galpal! She started to enjoy more of the good things in life, including outings to dog parks and lots of quiet cuddle time. 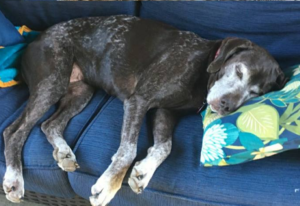 Now she has found a permanent, loving home with a couple who had their hearts set on adopting a senior dog, and who live—where else?—in “SUNNY”vale.